WE CANNOT ADVERTISE A LOWER PRICE FOR RINEHART PRODUCTS EXCEPT FOR MANUFACTURER SUGGEST RETAIL PRICE ON OUR WEBSITE. 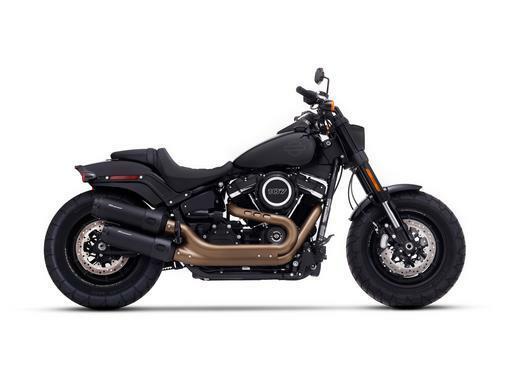 Rinehart Racing, the leader in Harley-Davidson® Touring slip-on exhaust, now delivers the same sound performance and quality upgrade for the all new Fat Bob. Installs with no modifications needed, simply replace your stock mufflers and give your Softail the Rinehart rumble it deserves. With factory matched finish and laser etched end caps, the look and sound of the 4.5″ Slip-On mufflers for the Fat Bob are the ultimate upgrade, giving your bike a flawless appearance and serious sound and performance increase. NOTE: These mufflers retain the stock catalyst and are 100% CARB and EPA emissions compliant.